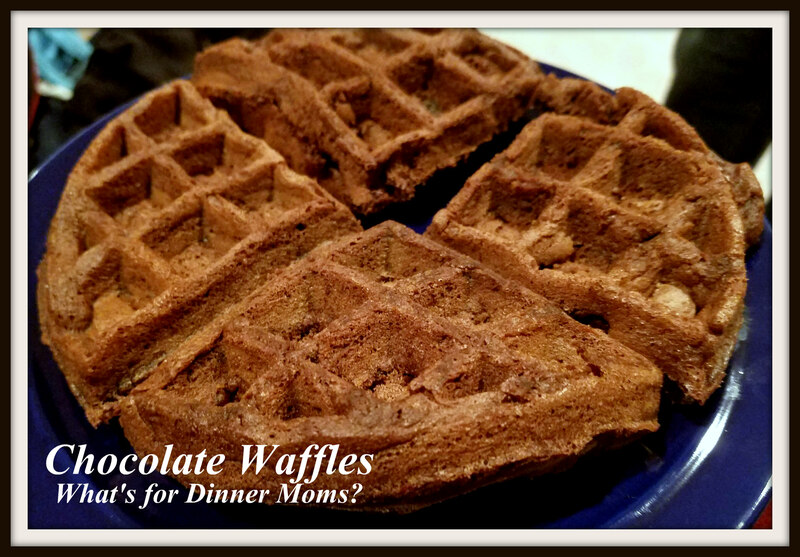 Chocolate Waffles – What's for Dinner Moms? I have decided chocolate waffles are a hard item to photograph. I tried to grab a picture while the girls were getting their waffles from the waffle bar but the light was off so they kind of look whole grain rather than chocolate. I decided to do Buttermilk Waffles (click for link to recipe) and Chocolate Waffles for the waffle bar. The Buttermilk Waffles were the favorite for dinner but that only because these waffles belong more as a dessert waffle. These waffles are so sweet and full of chocolate flavor that they really need to be a dessert waffle. Piled high with whipped cream and sprinkles or a scoop of your favorite ice cream between two sections of the waffle would make an amazing dessert or sweet treat! These waffles took almost no time to cook and were so simple to make. A delicious dessert waffle that is easy to customize. In a large bowl mix flour, sugar, cocoa powder, baking powder, baking soda, salt, and nutmeg until well blended. Create a well in the center of the dry ingredients and add eggs, butter, vanilla, and buttermilk. Stir until just mixed and then gently stir in chocolate chips. Grease waffle maker and cook according to waffle maker directions. I found mine cooked faster than usual so watch the first batches carefully! Serve topped with whipped cream, a peanut butter or chocolate drizzle, or ice cream, as desired. A breakfast or dessert treat! Yes! Some good ice cream and caramel sauce? Yummmm. I like to make waffles out of cans of biscuits or other packaged mixes. Chocolate has been on my list to try soon. I thought maybe a brownie mix but these might be easier! I have done brownie mix ones and they are good but this one was better. These were more waffle like than edge of brownie like.